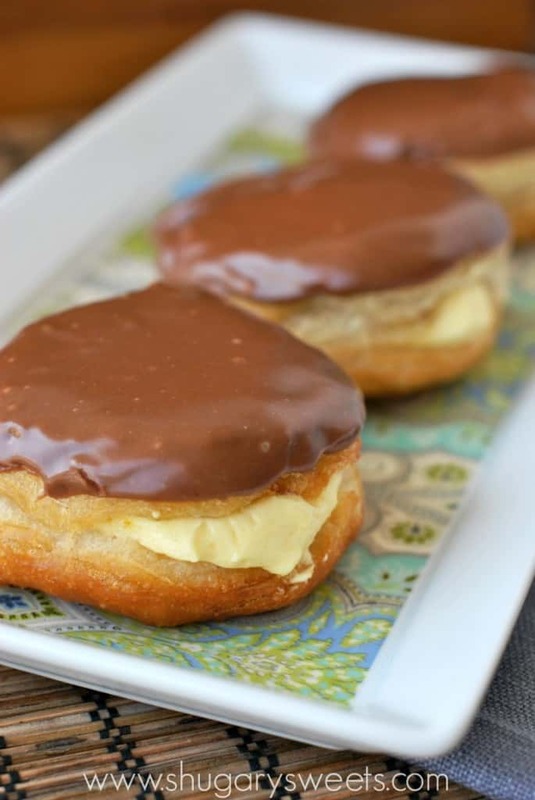 Easy, fried Boston Cream Donuts in under 30 minutes! Made using Pillsbury Grands biscuits and filled with a creamy pudding mixture, these are sure to tempt you! Don’t forget the rich chocolate ganache! Well, school is in full swing and it’s time for Curriculum nights. In the younger grades, it’s not so painful. You sit in the classroom and hear a quick overview of what your kids will learn. Meet the teacher. Not bad. In high school, totally different. I’m making my husband go this year alone because last year I had nightmares for weeks about homework, projects and public speaking. Basically, you get your child’s school schedule, and you make the rounds to each classroom. The bell rings and you move on to second period. Bell rings, move to 3rd period. Meanwhile, in the hallways, you have 4,000 adults rushing to their next “class.” Seriously. It’s what nightmares are made of. And let’s just say, you don’t want to be last to class, because just like in high school, the only seats left are up front. Gah!!! So while my husband is at curriculum night tonight, I’ll be enjoying an extra donut. And pushing off thoughts of penny loafers, pimples, and math class. As for the donuts, these are super simple to make! Using a roll of Pillsbury Grands helps cut time, but not flavor. I whipped up the pudding mixture before frying the donuts, giving it time to set and chill. I made a creamy, rich chocolate ganache for the frosting. If you want to cut an extra step you can totally use canned frosting. Heat it up in the microwave for a little bit (maybe 30 seconds to a minute), stir and spoon it on the donuts. ENJOY! 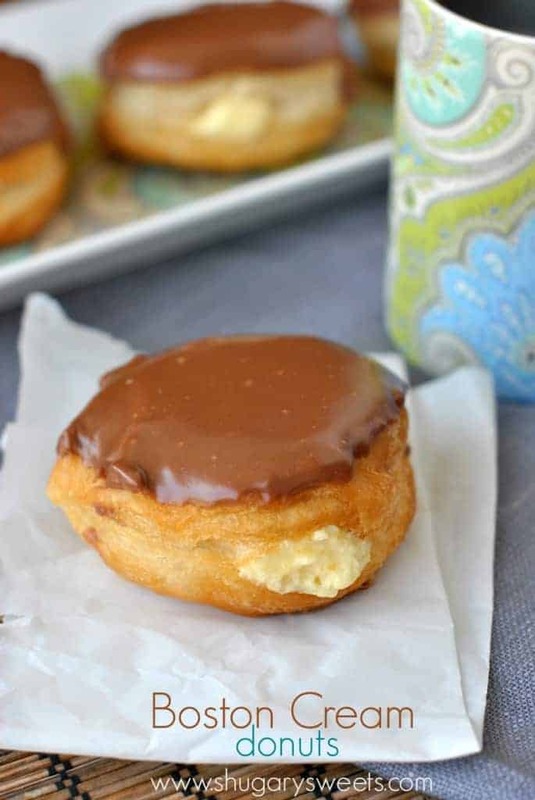 Easy, fried Boston Cream Donuts in under 30 minutes! Made using Pillsbury Grands biscuits and filled with a creamy pudding mixture, these are sure to tempt you! Don't forget the rich chocolate ganache! Separate biscuits. Fry each biscuit for 2-3 minutes each side. Allow to cool and dry on paper towels. For the ganache, add cream, milk, butter, vanilla and corn syrup to a medium saucepan. Heat on medium until butter is melted. Turn to low and add in the chocolates. Whisk continuously until smooth. Remove from heat and whisk in the powdered sugar until ganache is smooth. Set aside. To assemble, spoon filling into a large pastry bag with tip (any tip will do). Press tip into side of donut and squeeze until donut appears "full." Repeat for remaining donuts. Spoon warm ganache over each filled donut. ENJOY! I save the used oil to use again by allowing it to cool slightly, then storing it in a mason jar. I strain off any fried bits while pouring it in the jar. Saves money!! This recipe will have extra filling leftover. I enjoy making a trifle using this extra filling (bake up a brownie mix and layer it with filling in a trifle bowl). Or spoon into bowls as dessert. ENJOY. More Delicious Donut recipes for you to enjoy! Aimee you have really out done yourself this time! These are my all time favorite donut and will always buy over any other donut! To think I could do this at homes led me want to run to the store right NOW!! I usually pick a cream filled donut above any others as well 🙂 Now go make some donuts!!! Oh my, I love how simple these are. These would be so time consuming without the biscuits and pudding! Delightful. 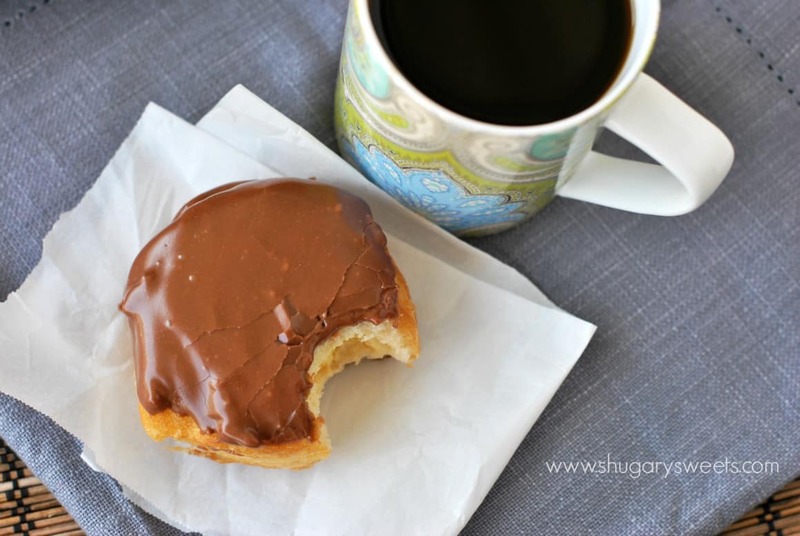 I love Boston cream donuts – they are my favorite donut flavor. And I am so grateful that this recipe uses some shortcuts so I can be happily eating a few donuts within 30 minutes. Thanks, Aimee! Oh my these look heavenly, I want bite right now! I’m going to have to make these babies for sure. You seriously rocked my world when we did the gordough’s copycat recipe and you used Pillsbury Grands for that recipe and now you’ve done it again with this because I was wondering if you could make stuffed doughnuts using the biscuits too. These look amazing! Yep, you can totally stuff them. You just have to be careful not to overfill or the layers start to separate! If you want smaller donuts you could use regular sized biscuits, and those stuff easily too because they aren’t “layered” like a Grands biscuit! Donut day tomorrow – torn between your apple pie ones and these! Wait, I could just make both . . . the more the merrier! Your picture with the coffee sent my mind dreaming of this in the morning:) Right now sounds even better! Jello for pastry cream and Grands for dough. LOVE IT when you can save time and skip about 23 steps 🙂 Great thinking on the time-savers! These look wonderful! I was just in Boston and enjoyed some Boston Cream Pie! 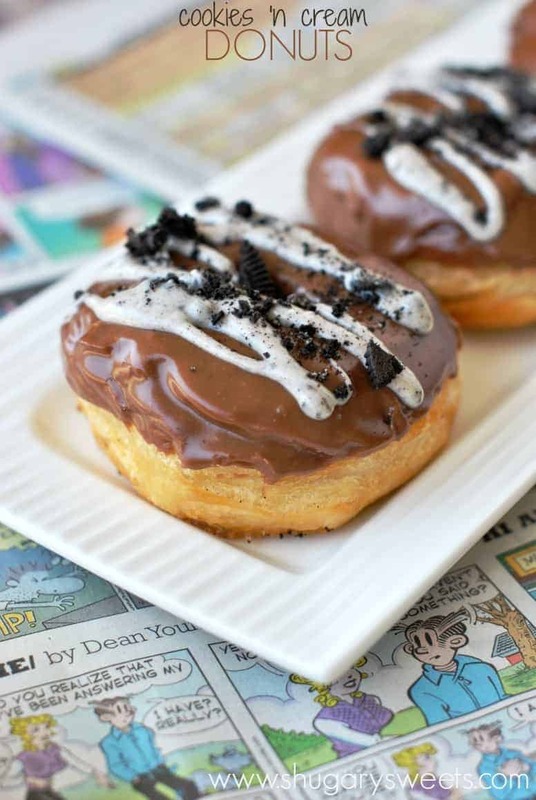 I’ve always loved it, so these donuts definitely grabbed my attention! They look delicious, and if I can make them in under 30 minutes, I’m sold! I love Boston cream Pie! Which is why these donuts are my favorite! Is that what we have to look forward to in HS? Ugh, 3rd grade open house is so much easier! These donut’s knock it out of the park Aimee. You pretty much had me at donut! I love that you sent your husband to curriculum night on his own! 😛 my kiddos are still really young, (6 and 2 1/2) so totally not looking forward to high school. . at least you have these fabulous doughnuts!!! and love the cheater recipe!!! Brilliant!!! I never ever go for cream filled donuts and suddenly I’m wondering WHY?! I need these in my life! What?? You don’t go for the cream filled? Well, that’s actually good. Next time we are together we go for donuts. I get the cream filled, you get the dry, boring sprinkles! ha! Boston Cream Donuts are one of my favorite donuts, and you made them look so easy so now I’m worried because I will just make these all the time! Looking so delicious… I want one (really 6). Wow, these look amazing!! 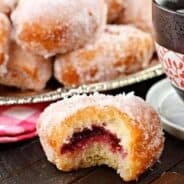 I just became more than a little bit hooked on custard-filled donuts from the grocery store… The idea of making my own is positively dangerous!! Yum!! Cream filled donuts are my absolute favorite kind!!! I love all the short cuts in these…totally my kind of baking! And I love that you sent your hubby to school to fend for himself in the crowds. This is such a creative — and efficient — use for Pillsbury biscuits. I’ve never tried making donuts because I’ve always been slightly intimated by them. But you’ve convinced me that I might have to give it a try. I NEEED THESE In MY LIFE!!! Oh and right now I am on a donut kick! I can’t get enough of strawberry jam filled donuts here in England and I know I will get home and make these!! Gorgeous!!! LOL, I remember being the teacher at back to school night! We have Jordan’s tonight, and it’s not too much better, seating wise. I’ll sit in a kid chair and Mel will have to stand. These donuts are the BEST! Yum! One of my favorite donuts! 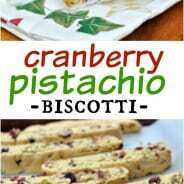 I can’t believe these are made with Pillsbury Grands … Awesome! These are my favorite doughnuts of all time! I need 5 of them now please. 🙂 Gorgeous award! 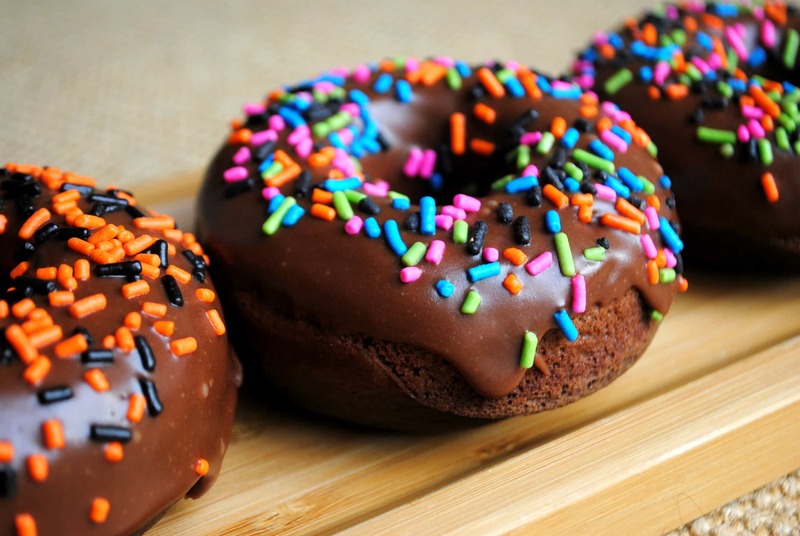 These donuts look amazing! Boston Cream is like one of the best flavors on this earth. haha! 🙂 I love your chocolate ganache! It looks great. 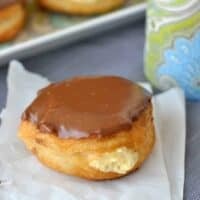 Boston Cream Donuts are my favorite donuts of all time!! It’s a total guilty pleasure. Whenever I buy a dozen from Dunkin, I’ll split one in half in hopes I won’t eat the other half. I have no self control, so of course I eat it! I love how you used Grands in this recipe. Makes it SO easy to make these on a Sunday morning. These look just like the real thing! So perf! All time favorite donut, right here! Yours look incredible, Aimee! Wow!!! What donuts!!! Definitely, a sugary treat to die for… I am drooling!!!!! Boston Creams have always been like my all time favs. They were also the first donuts I ever tried. Can’t wait to try them! Oh man these donuts look terrific! I do NOT envy you for that back to school night; though. My parents pretty much just skipped it entirely and I turned out “relatively” normal. 😉 I’d rather stay home and eat these donuts instead! These sound pretty much amazing!!! These were truly amazing! Had them this morning. Didn’t read each post, but do these freeze well? 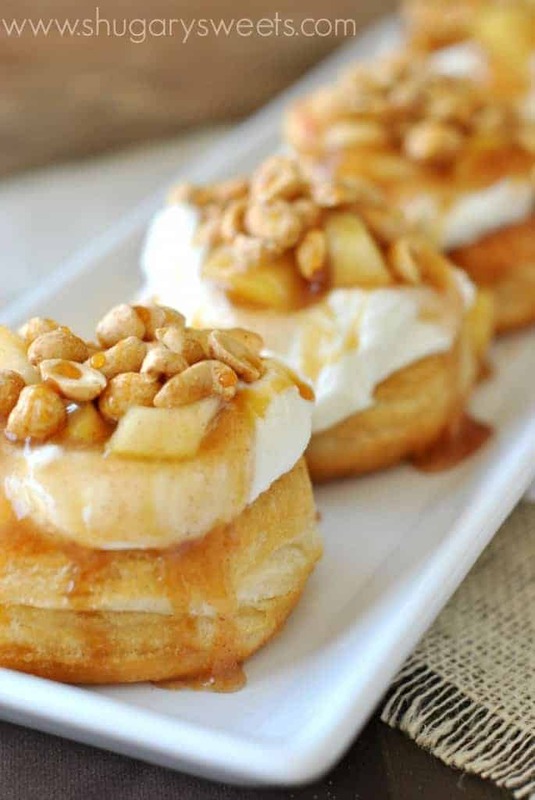 Just made these but used banana pudding instead turned out absolutely delightful!! Definitely will be making them again. There are so many types of grands biscuits, buttermilk,flaky etc. I was wondering which donut you use? 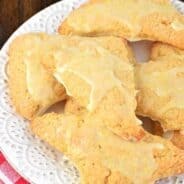 There are so many grand biscuits , flaky, buttermilk, I was wondering which biscuit you use? I use the flaky Grands biscuits. But really, any would work! I found this recipe on pinterest and am drooling! I want to make it this weekend when we have company and am curious – what chocolate do you use in your ‘special’ frosting? All I could find at the store was un-sweet and semi-sweet. Thanks! I use dark chocolate and milk chocolate together. I usually buy the Green & Black’s brand for making ganache. It’s sold in chocolate bar form (mine is in the organic section). You can also use Ghirardelli. 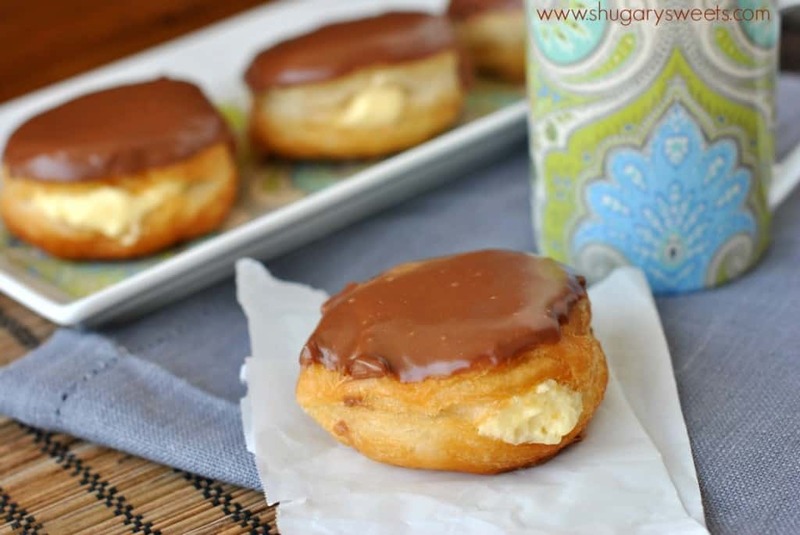 I love how simple these are…..
Can you freeze the Boston Cream Donuts? I wouldn’t recommend freezing these donuts. These look amazing!! I’m in Australia though and have never heard of these biscuits. Devastating. These look amazing as a special treat! I can’t wait to try making them with my daughter sometime! Now, I have a taste for these again!!! Happy New Year! These look absolutely amazing! Pillsbury Grands biscuits are going on the shopping list for this weekend! OMG! So good. And so easy! Can you please give me a recipe for Boston Cream Doughnuts with fresh ingredients, not packaged stuff. I find all American recipes use packaged stuff. I only cook from scratch. Thanks in advance..